Last week’s snowfall either made you feel blessed to have the moisture or gloomy as you long for spring to take a firm hold. Whatever your take, these restaurants have rolled out their spring menus and should whet your appetite for fresh, seasonal fare from some of Denver’s finest. 1515 Restaurant in LoDo offers fresh, approachable flavors that with their unique twist, using molecular gastronomy to offer fine dining in a new light. What to try? Bison Two Ways, with “Ginger Beer” Braised Short Ribs and Sous Vide Steak with butternut squash mousseline, root vegetable succotash and horseradish foam. Coral Room in Highland has just promoted long-time sous chef, Greg Lyons, to executive chef. It’s easy to see why when perusing their mouthwatering new menus for both lunch and dinner. What to try? Vegetable Udon Bowl with seasonal vegetables, peanuts and Thai-ginger soy sauce. Central Bistro & Bar in Lower Highland has seen chef Matt Selby sprinkle its menu with tasty magic since he came on board earlier this year. Sit on the patio and watch the beautiful people stroll by while sipping on a housemade gin and tonic. What to try? Crispy Skin Chicken with Morel mushrooms, fingerling potatoes and English pea ragout. ChoLon hasn’t completely reworked their already fresh and fab menu, but they do have several new additions to honor the season. What to try? Lobster Saigon Crepes with asparagus, mushrooms and lettuce cups. Coohills, link the only downtown restaurant that sits along Cherry Creek and boasts a beautiful view of the Wewatta Bridge, has one of the largest and most comfortable patios in which to enjoy crazy colorful sunsets. What better way to take in their spring menu and sip on one of Colin Dart’s creative cocktails? What to try? Cape Cod Scallops with grapefruit, strawberry, cucumber, prosciutto and wild cress (pictured below). 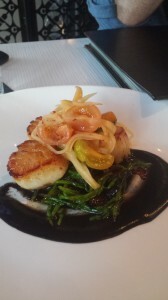 Opus in Cherry Creek North has a menu that is French inspired with a creative twist. You can sit in their dining room with old world charm or soak in the sun on their patio. What to try? Beef Cheeks with fennel, orange and olives. Tables chefs Amy Vitale and Dustin Barrett’s cozy Park Hill restaurant with a charming picket fence-enclosed patio screams “spring”! What to try? Shetland Island Salmon with radish-spring pea has, chimichuri-cucumber yogurt sauce and a crab and pickled radish salad. The Ballpark nieghborhood gem, Trillium, not only has updated their menu for spring, but they’ve also launched a new happy Hour menu just in time for Rockies season. What to try? Braised “Never, Ever” Colorado Lamb Shank with root vegetables, Danish blue cheese polenta cakes, “living” watercress and lemon gremolata.